2018 was a terrible year for pay-TV operators in Asia Pacific, and pay-TV consolidation is expected to continue, according to analysts Media Partners Asia (MPA) research released on the eve of this year’s Asia Pacific Video Operators Summit (APOS) in Bali on 23 April. Except for India, which “stands alone as the last major buffer against secular weakness in pay-TV in Asia,” MPA says. Even then, regulators are threatening growth in the near term with new regulations that threaten pay-TV subscription and advertising growth. 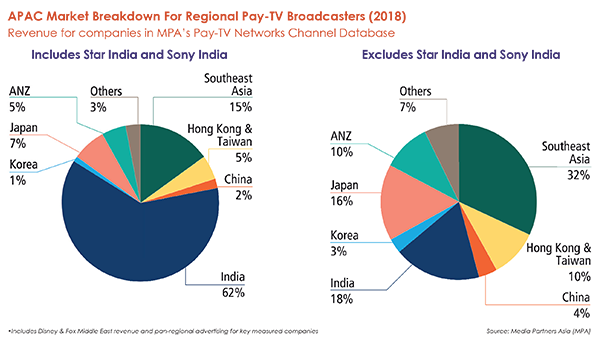 Outside of India, pay-TV channel operators in Asia Pacific looked at “severe deterioration” in earnings and profits across the region for 2018, MPA says in its latest update to its Pay-TV Networks Channel Database. Aggregate revenues across 13 major pay-TV networks grew by 1% in 2018 to reach US$4.9 billion, compared to 5% growth in 2017. Combined ebitda fell by 5% in 2018 to US$0.9 billion; and by 8% to US$0.5 billion if Star India and Sony India are excluded. Across the 13 groups covered, India accounted for 62% of pay channel revenues in 2018. This was led by Star India (now owned by Disney) and Sony India. Excluding revenues from Star and Sony India, Southeast Asia leads, contributing 32% of revenue in 2018, driven by Disney (including Fox), WarnerMedia and beIN. India would then contribute 18%, led by Disney, Discovery and WarnerMedia, followed by Japan with 16%, led by Disney, Discovery, WarnerMedia and Viacom. Hong Kong/Taiwan & Australia/NZ contribute 10% each in this scenario. The biggest channel networks ex India in Asia including Australia and Japan in terms of revenue in 2018 were Fox Networks Group, Disney, Discovery, Turner, beIN and HBO. Factual and lifestyle pay-TV channels had the biggest share of revenue by genre in 2018 (excluding large local networks in India) with 21% in 2018, followed by kids, also with 21%. English-language general entertainment channels had a share of 17% in 2018, which was a “material” decline from 19% in 2017, MPA said. News took 3% and music (2%). Three genre categories increased their share: Sports, with a share of 15% share (up from 14% in 2017); English-language movies, which increased from 11% in 2017 to 12% in 2018; and Asian entertainment, which rose to 9% from 8% in 2017.